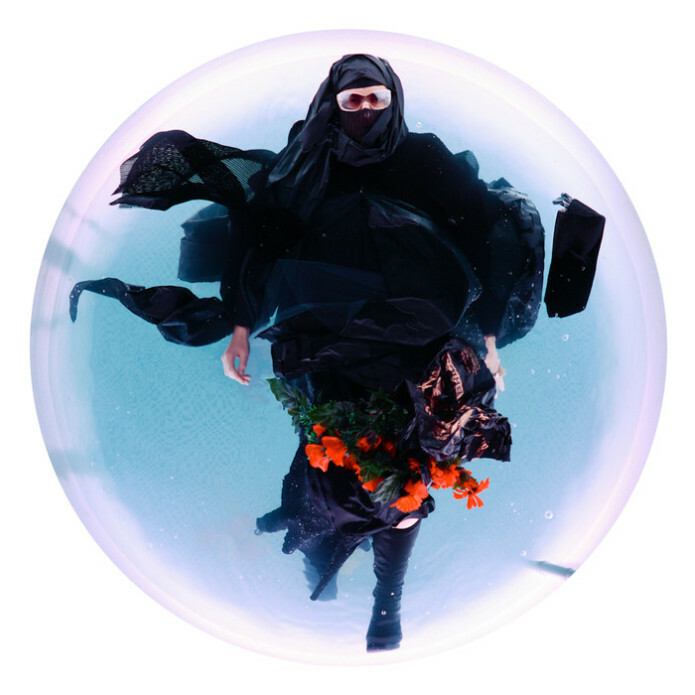 Can art help us viscerally understand climate change? Lars Jan’s HOLOSCENES is an epic public art and performance installation that is a visual, visceral response to climate change. Presented in public space, the centerpiece of HOLOSCENES is a large aquarium that floods, drains, and floods again by way of a hydraulic system that moves 12 tons of water in a minute. The aquarium is inhabited by a performer conducting one of many everyday behaviors sourced from collaborators across the planet. We can’t wait to see how this project evolves. It is a bold, thoughtful response to an issue we will all undoubtably face- and perhaps currently fear. You can help support this incredible work by visiting the HOLOSCENES Kickstarter. 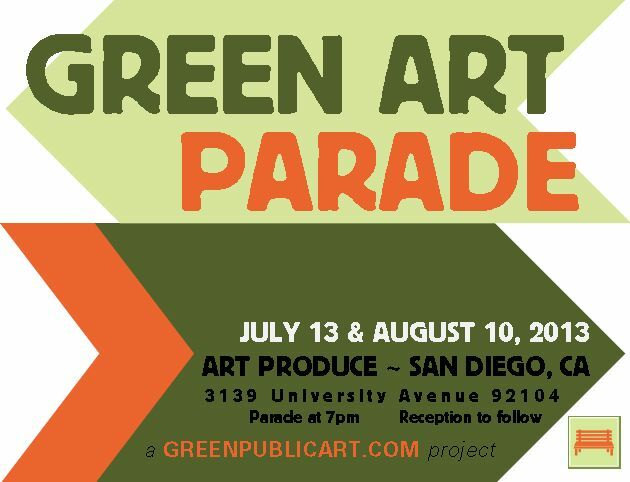 Join us on two Saturday evenings this summer for a GREEN ART PARADE, a curated street spectacle of portable sculptures, art bikes, green fashion and performances by Southern California artists with a message about the environment. The PARADE will begin at 7:00pm at Art Produce (3139 University Avenue, San Diego, CA 92104). 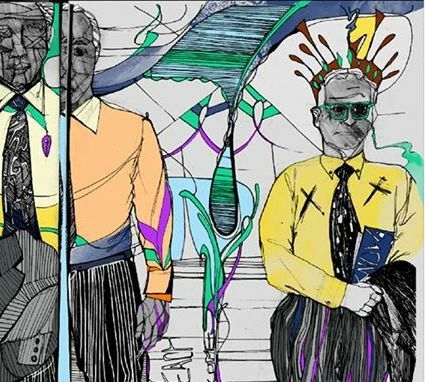 The parade will conclude around 8:00pm with a reception for the artists at the Art Produce gallery. Visit some of the local North Park businesses for prime viewing locations along the route: Art Produce, Urbn, Splash, Pigment, Linkery, West Coast, Heaven Scent/Bottle craft, Wangs, Hesse, Vintage Religion, and Swoon. Dia Bassett, an artist from San Diego, was raised in a family of artists and began performing at 5 years old in her father’s productions. Her involvement in performance both behind stage and onstage has influenced her art, leading her to create a blend of sculpture and performance. She uses a combination of traditional fiber techniques such as sewing, weaving, crocheting and knotting to create soft-sculptural forms, some of which are worn on the body during performances. 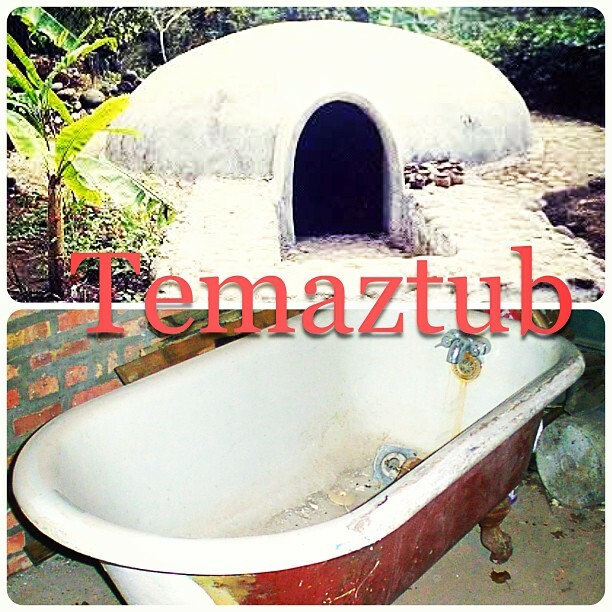 Artist’s statement: Temaztub is an invented term referring to the Western European tradition of bathing in a claw foot bathtub mixed with the Mesoamerican rite of purification in a sweat lodge called Temazcal. The hybrid form of Temaztub will juxtapose elements from each bathing structure of basin and dome. Temaztub is a mobile sculpture attached to wheels so that it can easily be pulled in the PARADE. Temaztub is also a sculptural performance, which combines bathing traditions from indigenous and Western cultures. Western cleanliness requires soap and fresh water, though other traditions, like Mesoamerican, rely on minerals, rock and mud exfoliation, herbs, and steam. Because bathing traditions fluctuate over time and place, I want to ask viewers to reexamine their ideas of “clean” and “pure.” The performers’ mash-up of bathing traditions serves to confound viewers and give them the opportunity to pause and ponder the notion of bathing. …more information about this project to come! 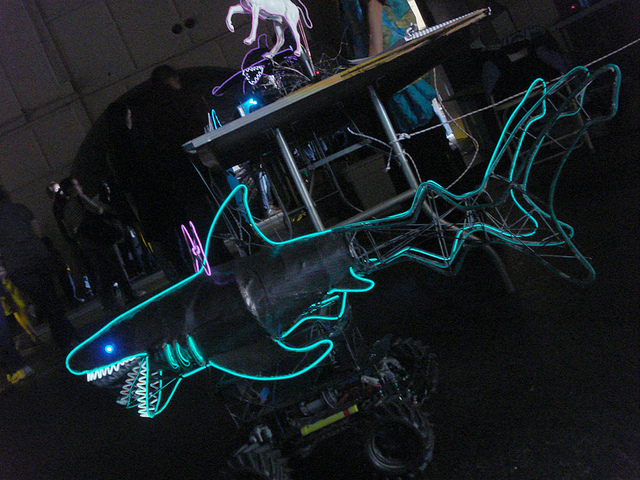 Suki Berry and 8 other friends will bring a group of glowing Shark Bikes to the PARADE. Species like Great White, Hammerheads, and Basking Sharks, each measuring about 5 feet in length will be attached to bikes riding in the PARADE. Every year tens of millions of sharks are slaughtered for only their fins, a process called “shark de-finning.” Without fins, sharks cannot swim, and without being able to move water through their gills, they drown. If the fishing rate of sharks keeps up we won’t have many of these beautiful fish left in the ocean. Over fishing is a huge problem today, and eliminating more shares from the ecosystem throws off a delicate balance. A. Laura Brody creates works of beauty, function and purpose that are ecologically sound. She gives fabric remnants and discards new life as works of art shaping them around participant’s bodies with a stapler, staples and scissors. The newly dressed viewers will then be encouraged to join the parade for as long as they wish. Artist’s statement: Many people in the Western world have little to no experience in making or working on their own clothing. The craze for fast, cheap fashion and goods is unsustainable in and encourages horrible excesses. The Bangladeshi garment factory collapse and the Foxcon scandals are sadly just the most recent examples in a long history of the ultimate cost of making cheap, mass-produced goods. 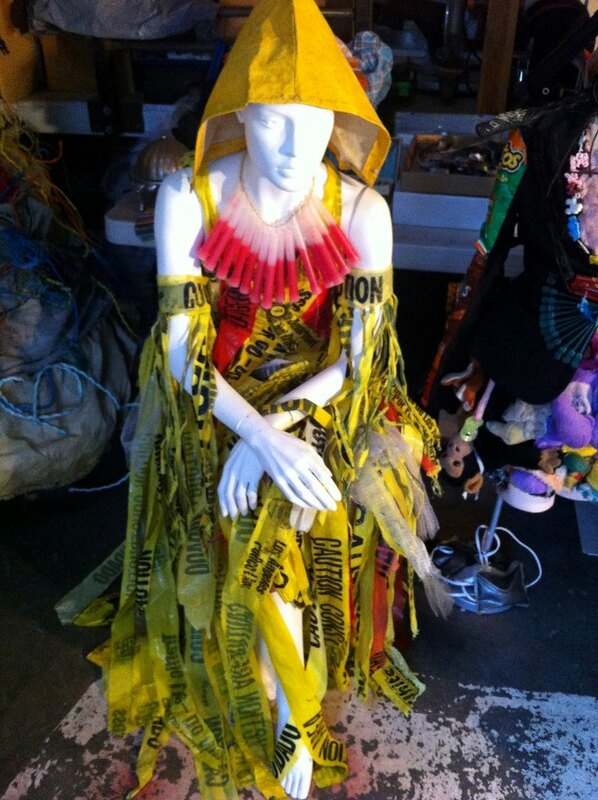 Even “sustainable” fashion is suspect, because of the toxic processing required to generate, bleach and dye fabrics. Encouraging people to start making their own clothing from reused materials is a positive way to help break this vicious cycle. My staple draped creations are made exclusively from reused and donated fabrics. The only new materials used are the staples. 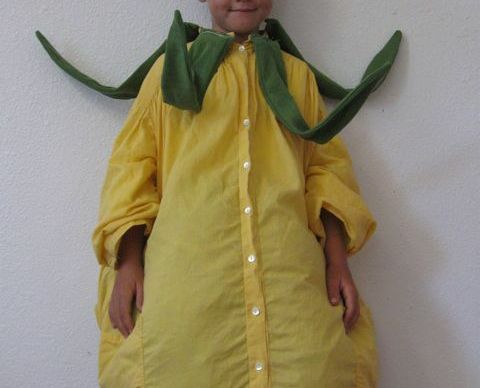 Staple draping is an unconventional way to get people engaged in the art and fun of creating, using simple and inexpensive tools and materials. It shows people the delight of sculpting on the body and opens them up to their own creative possibilities by demystifying the making process. 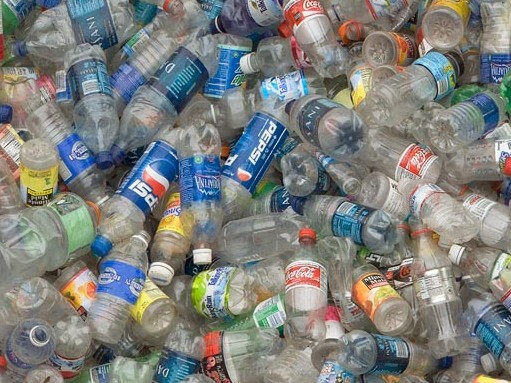 Wearing street clothes and a red-ball clown nose Richard Gleaves will walk the parade route pulling, over his shoulder, a line connected to a bridal train of several hundred plastic bottles, which drag and rattle on the pavement behind him. Artist statement: May your throwaway follow you everywhere. Terri Hughes, an Associate Professor at San Diego City College, creates sculptures, interactive and site-specific installations, and public artwork. She directs the Sugar Museum, a non-profit museum that organized exhibitions and projects at various locations. Her recent artwork is themed on her childhood memories of growing up surrounded by oil wells in Huntington Beach and the transformation of that city. For the PARADE, she will create a mobile sculpture made of 95% repurposed materials; a 8’ x 2’ x 10’ oil pumper made from Styrofoam scraps which will be pulled by 6-8 children wearing heirloom tomato costumes made from thrift store fabrics. Artist’s statement: The oil pumper structure symbolizes our dependence on fossil fuels and most people do not realize that conventionally grown food uses lots of fossil fuels. But, local organic farms growing heirloom tomatoes produces far less of a carbon footprint than conventionally grown tomatoes. One could view this project as ironic since typically the fossil fuels produce the tomatoes and here, the tomatoes are pulling the oil pumper. It also could be viewed as the heirloom tomatoes pulling the oil pumper, a dead horse, a thing of the past. I often use humor and sarcasm in my artwork. Involving kids in the project will also symbolize hope for the future. Miki Iwasaki’s curiosity in making and building things eventually led him to pursue a career in architecture, and attend California State Polytechnic University in Pomona California. Miki also studied for a year at the Kyushu Institute of Design in Fukuoka, Japan and received his Masters in Architecture from the Harvard Graduate School of Design in Cambridge, Massachusetts. Miki, currently adjunct faculty at Woodbury University San Diego, School of Architecture, has remained dedicated to his own art projects and furniture designs. Artist’s statement: As we look back on the history of personal transportation in California, we have a relatively short but colorful story. From the early California pioneers and the covered wagon, to the advent of the automobile and it’s many permutations, to bicycles, skateboards, segways, scooters, recreational vehicles, custom cars and travel trailers, the culture and identity of California has been intertwined with the way we move. Many fascinating inventions and vehicles have already been introduced and are currently on the drawing boards of designers and creative people today, all in an effort to satiate our longing to explore and our need to get from point A to B. 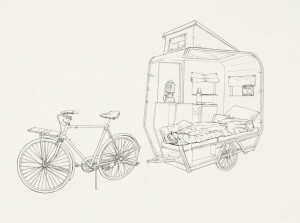 The Caravan project for the PARADE celebrates this history and introduces a mobile space of sorts, a way of having fun while thinking about a range of questions surrounding transport. What we choose to ride, how long it takes to get there, where the materials and fuel come from, how it is made and why we are so dependent on them, are all questions worth asking. David Krimmel is a community artist, museum exhibit designer and aspiring farmer in San Diego, CA. His art spans many genres from the wheat hARvesT project to performance collaboration, “A Watershed Tale,” with the Mid-City Propagators. 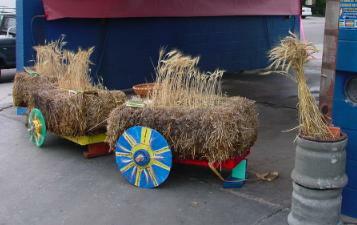 Artist’s statement: Demeter’s Chariot references the Greek goddess of Demeter, the god of the harvest and her chariot pulled by horses. 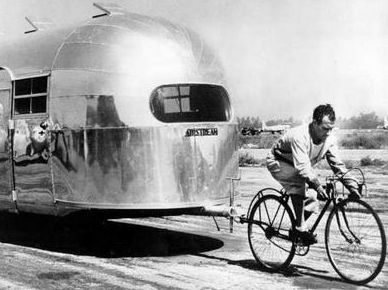 Riding in the artist’s mobile sculpture will be Demeter. The public will be invited to a workshop where they will make vegetable hats, with materials provided by the artist, to wear in the PARADE. Benjamin Lavender’s art reflects his lifelong fascination with the growth and erosion of nature. His signature style involves shaping metal and industrial objects into organic forms reminiscent of plant life. His latest sculptures are constructed primarily out of metal straps (from reclaimed whiskey and wine barrels) that have been cut, shaped and twisted into the shapes of various forms. His 7ft in diameter sculpture will be pushed along the streets in the parade. Artist’s statement: The Idea behind this piece is that once the “ball” is in motion, it is our responsibility to keep this ball rolling on the right path; in this case referring to environmental awareness using green materials. 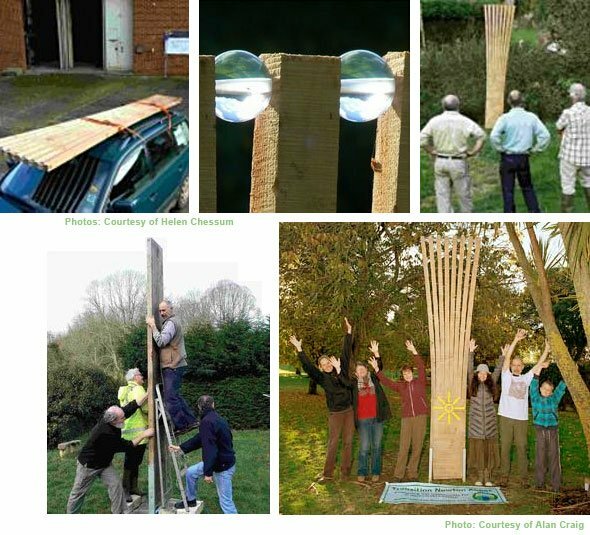 My sculpture will be a large ball (approx.. 7’ diam) made of reclaimed wine barrel hoops, circling around a ceramic inner ball suspended in the middle representing the earth. Visually, I want to create the earth inside of its atmosphere, which is of obvious concern when promoting green building and conservation. 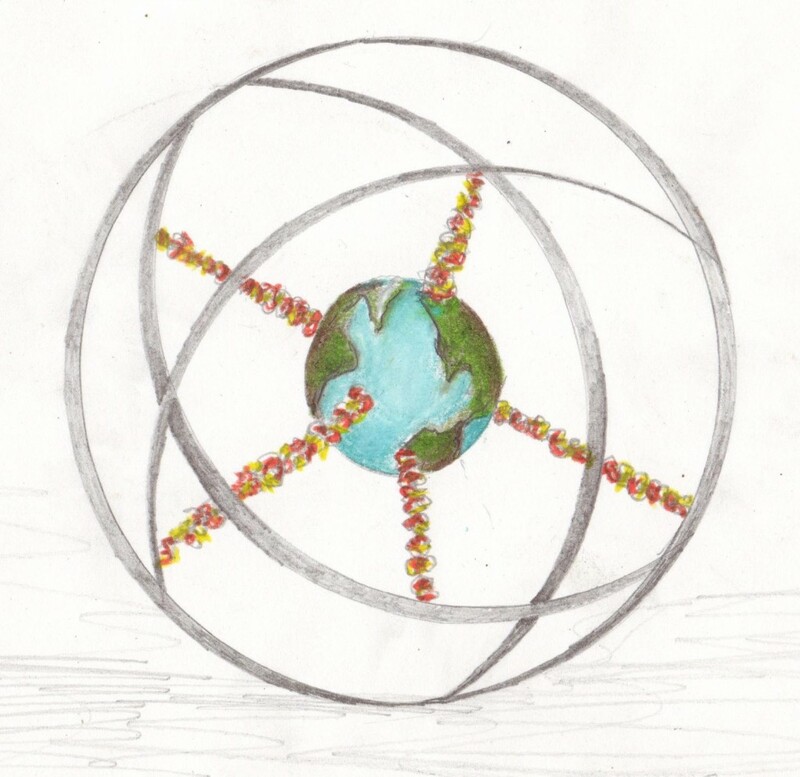 Also, I want this to double as a single cell, with the planet representing the nucleus. Since the single cell is what all living animals start out as, it is the first “ball” to get rolling. Interested in participating? 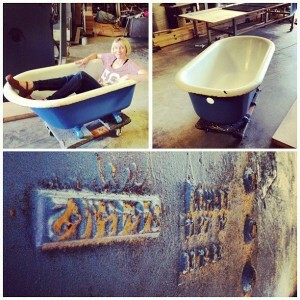 Contact Rebecca Ansert at rebecca@greenpublicart.com. 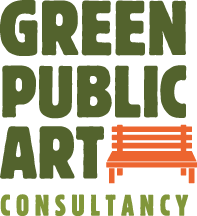 Rebecca Ansert, founder of Green Public Art Consultancy, is an art consultant who specializes in public art project development and management, artist solicitation and selection, and creative community involvement for private and public agencies. She earned a master’s in Public Art Studies at the University of Southern California and has a unique interest in how art can demonstrate green processes or utilize green design theories and techniques in LEED certified buildings. She founded her Los Angeles-based firm in 2009 in an effort to advance the conversation of public art’s role in green building. Art Produce is a unique artist-run, storefront exhibition space and public art experience in North Park, a diverse and historic urban community of San Diego. The gallery, entirely visible from the sidewalk, is designed to accommodate sculptural installations, cross-disciplinary works, digital media, and performance events. The space allows for unconventional presentation opportunities for artists and unexpected art encounters for viewers. Intended to enliven the experience of the pedestrian it is an experiment in public art that is accessible to everyone in the community – an attempt to render visibility and transparency into the art process itself. Khoj’s international residency: In Context: public.art.ecology focuses on exploring ecological themes in and around public spaces in Delhi and is being carried forth into its fourth year. In continuance with last year’s trajectory, the residency, FOOD EDITION-IIwill once again have a special focus on examining the notion of food and its myriad articulations in art. The residency will be for six weeks duration starting in the first week of March until mid April 2013. Applications are invited from individual artists and artists’ collectives, with proposals for art projects exploring the intersection between art and ecology through a critical examination of issues surrounding the politics of food. 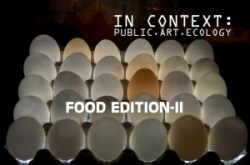 Food as artistic medium incorporating performance, art installations or interactive events that re-examine the significance and relevance of food in the social context, simply in its connection with the body or as a primary ritual that fosters engagement, interaction and collaboration. Costs of travel, modest accommodation and daily allowance are separate from the above production budget. Please send your proposals to applications [at] khojworkshop [dot] org. Mention ‘Food Edition-II’ Residency and ‘your name’ in the subject line. You haven’t heard from us in a while, as the Los Angeles Urban Rangers have been in relative hibernation since our Engagement Party residency at The Museum of Contemporary Art, Los Angeles (MOCA) last summer. Huddled together in the den, we’ve been busy whittling a new video about Public Access 101: Downtown L.A., expanding our virtual ranger station, reflecting on our active past, and imagining trails into the future. We want to announce to you, our steadfast cohort, that we’ve decided to enter into a phase of temporary dormancy (i.e. you won’t see us out and about, at least in uniform, in the coming months), partly due to long-distance migrations and other exciting metamorphoses among our rangers. Rest assured, our spirit of exploration runs strong and we will keep you posted of any and all adventures ahead. KCET collected over 30 stories from hikers on our L.A. River Ramble last August, which can be found on Departures. If you have any field notes of your own about experiences on the L.A. River, please let us know! Bill Kelley’s recent article for KCET’s Artbound is a thoughtful reflection on the topography and artistic climate in which we Rangers continue to explore. Longer “external guides” about the Los Angeles Urban Rangers are expected soon and we will keep you posted. As always, we enjoy hearing your stories of urban trail exploration! We’ll add your field notes to our Ranger logs. via Summer 2012 Report: Hibernation and Ranger Tales. As a sculptor, Stacy Levy uses art as a vehicle for translating the patterns and processes of the natural world into the language of human understanding. Her projects are designed so that the site tells the ecological story of itself. Meshing the clarity of maps and diagrams, and the accessibility of science with the visceral sense of the site, Levy tries to create an instant wonder and understanding for the viewer. Straw Garden is a six month project at the Seattle Center in Seattle, WA. The piece is made of erosion control wattles, in the shape of a baroque garden that spools out into a watershed form; all planted in native species of perennials and shrubs. At the end of the exhibition and the growing season, the garden will be divided and delivered to other landscapes in need of restoration and erosion control. Straw Garden uses modern landscape restoration materials in a baroque garden configuration. 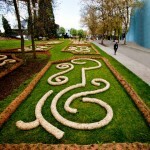 The symmetrical parterre are based on Le Notre’s design for Versailles. The straw wattles are most commonly used for sedimentation control while the coir (coconut fiber) wattles are used for erosion control, on slopes and stream banks. The baroque garden relied on two views, from within the garden and from high above in the manor house. This new garden also has multiple vantages: the lawn, and the elevated views from the monorail and space needle. This temporary work will have a second life as a plant source for landscapes that need restoration and native plant diversity. In several years the wattles will biodegrade, while the native perennials continue to take root and thrive. Straw Garden is part of The Next Fifty Seattle Center 2012, celebrating the 50th anniversary of the 1962 Seattle World’s Fair, exploring critical issues affecting the Pacific Northwest and the world, and creating synergies that inspire a shared future vision. 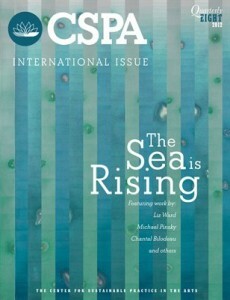 CSPA Quarterly #8 is now available for purchase through MagCloud. Members, your print and digital editions will find their ways to you shortly!. Our third international issue focuses on projects that call attention to topics that extend well beyond national borders. With a focus on interdependence, and an abundance of contributions about water, ice, and sea rise, this issue addresses the space between national borders- our oceans. Featuring work from Moe Beitiks, Chantal Bilodeau, Eve Mosher, Michael Pinksy, Christopher Robbins, and Liz Ward. We’ve been noticing a flurry of work that exists at the intersection between art and science. This includes installation and performance pieces that challenge scientific claims, and work that utilizes science to prove a point, or to reach a new audience. It’s about fact-imbedded art, or emotions and reasoning co-existing. Our tenth issue anniversary! For this issue, we will breathe new life into our pilot issue, and will check in with those participating artists. In her own words… “My name is Latai Taumoepeau, I am a performance artist with a new performance installation campaign called i-Land X-isle. It is about the impact of climate change on vulnerable indigenous communities from the arctic to coastal low lying islands. My body will be bound by rope to a 2 tonne block of ice to parallel the experience of already impacted people of human induced climate change to a form of water torture, that is imposed by developing countries. It will be live and a durational performance over 2 days. Where: Museum of Contemporary Art – Circular Quay Sydney.